After conquering professional wrestling and becoming one of the biggest box-office draws in Hollywood, Dwayne "The Rock" Johnson is pondering new conquests. And he's thinking about the White House. "I'll be honest, I haven't ruled politics out. I'm not being coy when I say that, but at the moment I am not sure. I can't deny that the thought of being governor, the thought of being president, is alluring. And beyond that, it would be an opportunity to make a real impact on people's lives on a global scale. But there are a lot of other things I want to do first." Movie stars getting into politics is nothing new, of course. We've had the likes of Ronald Regan and Arnold Schwarzenegger holding office. 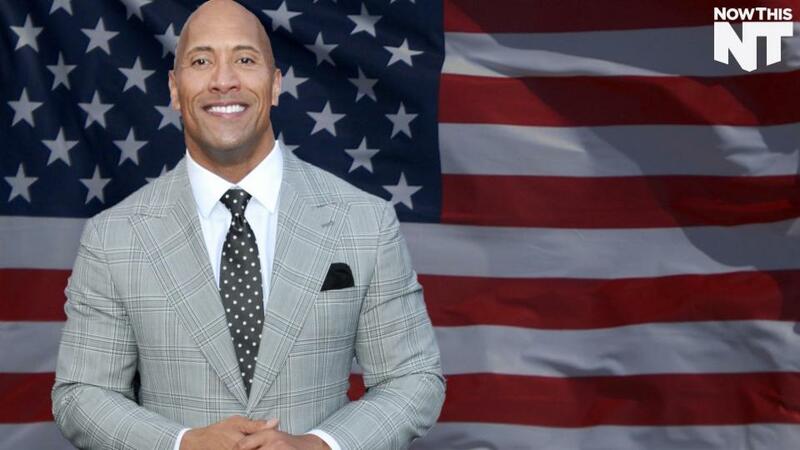 And with the current presidential election taken with entertaining personalities who are light on government experience — Donald Trump, and now even possibly Mark Cuban — it's becoming harder to scoff at The Rock running for office. But for now, Johnson has a lot on his plate. Coming up, you'll see him in season two of the HBO series "Ballers" and in the "Baywatch" movie. He's also voicing a character in the upcoming Disney movie "Moana," he's filming the next "Fast & Furious" movie, and he recently announced that he'll be the lead in the big-screen adaptation of comic-book hero "Doc Savage." The big moment where we surprised lil' 7yr old cancer warrior named "Tater" with his own #BAYWATCH movie poster! I wish you guys could've seen his face when I turned this frame around. When I told him "we're all so inspired by you, especially me" and looked down at him and saw him lookin' up at me, nodding his head with those big eyes.. good Lord I almost lost it in front of him and the whole damn crew. (that actually happened to me once before when I was accepting an award on stage and as I thanked my family, I just happened to catch my daughter Simone's eyes and sweet cheese on an ice cream sammich I almost lost it again). I did exactly what I did here.. paused, gazed into space like a crazy man and told myself "you better hold it together dammit", shook it off and proceeded to continue. Despite my almost tearing up like a baby and ruining my tough guy image, the greatest and I think most beautiful irony about Tater, is that this very special little boy has no idea just how much he inspires all of us around him. One day he will. #OnSet #OurWholeBaywatchCrew #UnforgettableMoment #LiveLikeTater #AndRocksDontCry * special thank you our good buddy and one of Hollywood's greatest photographers @jaimietrueblood and the @forthewinproject charity creating this awesome poster for Tater.